Ever since I was a little boy I was always fascinated by Indians (Native Americans). I have been told that they were the most colorful people that ever lived. For the past twenty years I have had an Indian Room in my house for my Indian collection (rugs, skins, photographs, tools, pipes, pottery etc). When I was doing historical research in the 1960's I tried to zero in on the Indians in the Vailsburg area. Looking at the roads from the 1800’s I could sense their presence. South Orange Avenue was laid on the path of an old Indian trail that went from the center of Newark up into the mountains. In Vailsburg it followed streams and ponds and snaked its way up to Horseshoe Falls versus Springfield Avenue, which wasn't and was laid out as a turnpike and is as straight as an arrow. I discovered another Indian trail within 300' of my house. This is now a combination of streets Valley Street, Stuyvesant Avenue, Silver Street to Sandford Avenue and then to Centre Street and Orange Park. The portion of the trail from Sandford Avenue was no longer used after 1830 but it originally went west right to Centre Street and then onto Orange Park. Why to Orange Park? That's where Chief Parroo lived. If one observes the attached map from 1850 the following can be noted. 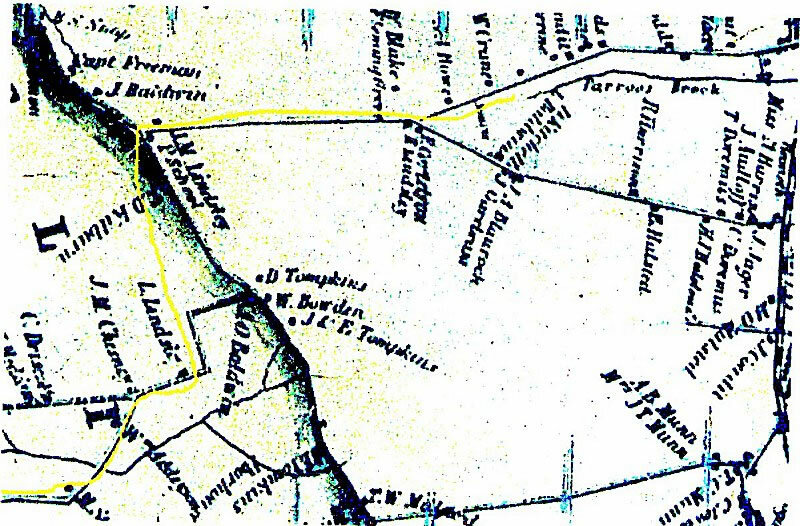 The highlighted yellow line is the path of the old Indian trail. At the end of this trail you can see the Parroos Brook, which was Chief Parroo's home. This highlighted map of the Indian trail will now join other Indian footprints in my Indian Room.